“He doesn’t need to hear all this; he’s a highly trained professional. We’ve assured the administrator that nothing would go wrong…” – Scientist, Half-Life, 1998. I was supposed to be spending yesterday evening writing a post about how things can go wrong and how to stop them from happening. Then a movie related friend of mine who I hadn’t seen in awhile said the word “beer”. Thus, I am now half drunkenly writing a blog post about reliability and professionalism. The irony is not lost on me. The one thing that frequently gets pointed to me on set is that I almost constantly look utterly relaxed. This is mostly met by mild jealousy and jokes about being a bum. The on set photographer is a unique role of a film production in that I am given a lot more freedom and independence than the rest of the crew. I have nothing to do with the actual creation of the film, however I am vital to the films existence in the marketplace, so Assistant Directors will for the most part give me a free pass to do as I wish. Freedom doesn’t necessarily equal a lack of stress however. Far from it. The quality of my work relies solely on my ability to carry out my job. At no point can I take a break and pass my camera to someone else and say “Hey, just take a few snaps while I pop out for minute will ya?”. While other departments will have teams of people, I tend to work alone, or at least rarely in cooperation with occasional photographers who happen to be on set for other reasons. Aside from being a remarkably calm person, the main reason I can afford to be relaxed is because I have already thought long and hard about how to avoid bodging the job up. Before I stepped foot on my first ever film set, I thought long and hard about whether I could even perform the task at hand. For me, failure simply isn’t an option, the embarrassment would crush me! In all my 6+ years of working as a photographer, I have never faced the shame of failing to deliver results, and this is no coincidence. While a substantial portion of my job is creative, an almost equally important part of the job is risk limitation. Digital has made photography remarkably safe. You can stick a wifi-enabled memory card in your camera and immediately have backups of your photographs literally all over the world. The odds of something going critically, irrecoverably wrong are incredibly slim. It makes many people happy. This is not the case with large format photography however. Even in a tightly controlled studio there are all kinds of situations where total loss of photographic assets can occur. 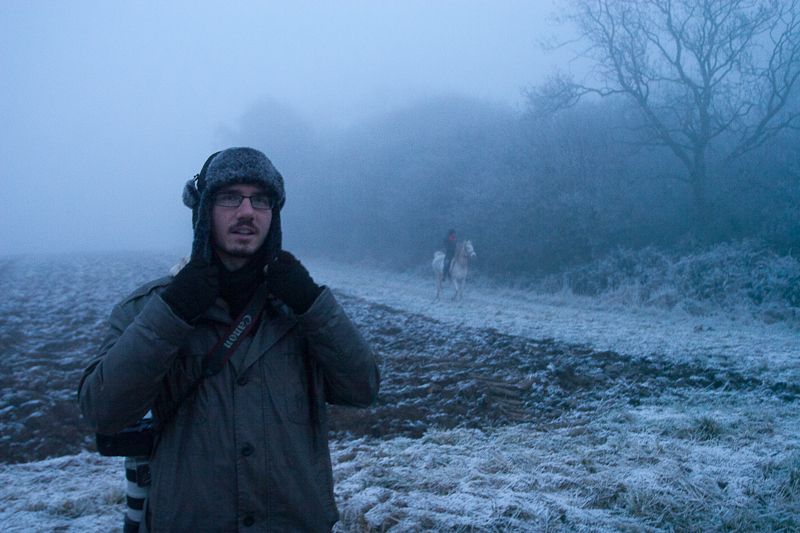 Unfortunately for me, I will not be in a studio, I’m going to be mucking about it a field surrounded by large animals. Where does all this extra danger come from? Film. I entirely lay the blame of my woes upon film. I’m not even working with 35mm film which is kindly held in canisters, no I’m manually handling large sheets of photosensitive film and shoving them into a contraption that has zero automatic parts. Actually, I think I blame myself. If a DSLR fails to expose correctly on any of its auto or semi-auto modes, you can blame a camera and adjust for it immediately. My Graflex however, doesn’t make any decisions, it only does exactly what I tell it to. So when the film is loaded, and I’ve removed it’s safety cover, all it takes is one moment of distraction to erroneously expose the film and ruin it. D/SLR’s are explicitly designed so that the user can look through a viewfinder without ever worrying about exposing the sensor. There is a shutter between the lens and the sensor that only opens to take a picture. In my Graflex through, the lens aperture is also the shutter! 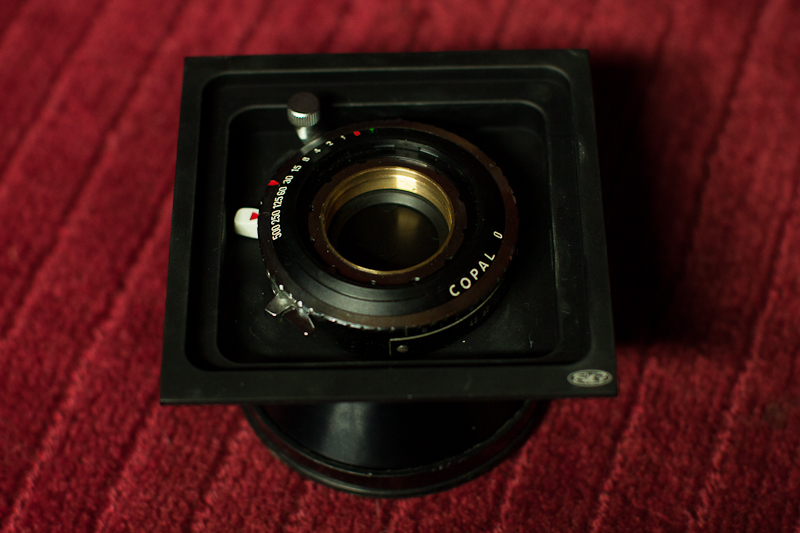 So after I’ve focused everything up, I then have to close it, then wind it up so it’s ready to be used as a shutter. It’s all too easy to slip the film in, remove it’s cover and forget that the lens is still open, and I’ll get absolutely no warning of my inability to pay attention. Hilarities ensue when you mix a shutter with an aperture. But that’s not the end of it! Danger is rife when handling film. 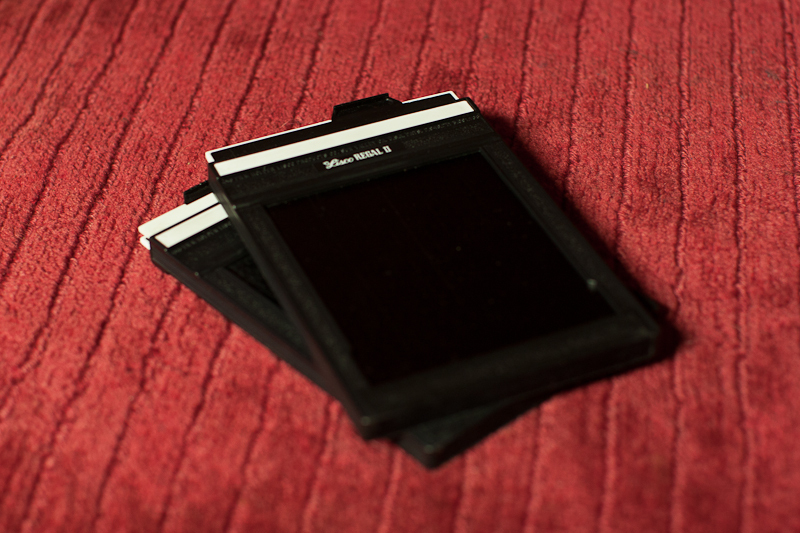 I could get fingerprints on the negatives when loading them into the film holder. Dust might get in and scratch everything to heck. I might miss-administer the film, contaminating colour with black and white, costing me much time in estimating what is what before sending them off for development, or worse yet, incorrectly telling the photo lab what’s what, ruining everyone’s day. All of this lies directly under my responsibility. Scary! Film holders are scarier than they look. All this could go wrong, and I’ve not even begun to discuss how my hi-jinx might affect others on set! Through my previous experiments, I would guess that a calm, controlled set-up and subsequent tear down of the Graflex takes me around 40 minutes. This would be at a fairly leisurely pace, however working fast causes problems, so this is a good estimate to stick to for now. How long do I need to take a picture on a film set normally? All of about half a second. Maybe a whole second if I’m really taking my time. With this in mind communication with the 1st AD will be critical, otherwise I might be 25 minutes into taking a picture, only to find myself IN SHOT. This is a death sentence for any crew member and must be rectified immediately, my photographs be damned. If I’m in the way and there are 30 horses impatiently waiting to action I need to move FAST, which really could ruin my day. So to prevent any tears I’m having to know the shooting plan for the day and be aware of any adjustments that have been made. So what can be done to prevent failure? Preparation, planning and knowledge. By the time I walk on set I will know exactly what’s going on. I will have carefully planned how I’m managing the film, and I’ll be making sure that all film related equipment is kept in a very safe area with little traffic from other crew members. I’ve also made a list of all the risks possible, and I’ve spent time planning how to counter these risks. Lastly I’ve also made sure that I know and understand everything about the camera and the film I’m using, I have all the technical leaflets with me and I’ve studied them countless times. There will be no technical questions in my head while I’m working due to the research I’ve done. Of course this is all theory, time will tell how everything works out in the field in two days time. If you’re enjoying my writing, please take a look at www.techunt.co.uk and throw them some love. Alternatively, if you’re feeling mean, throw abuse at me by emailing marc@marchankins.co.uk . This entry was posted on February 5, 2013 by marchankins. It was filed under Photography and was tagged with Film, Large Format Photography, Marc Hankins, marketing, Movies, Photography, Stills, Tech Hunt. Marc, why do you continue to use film when it causes quite a few issues to an already tricky situation to shoot in?